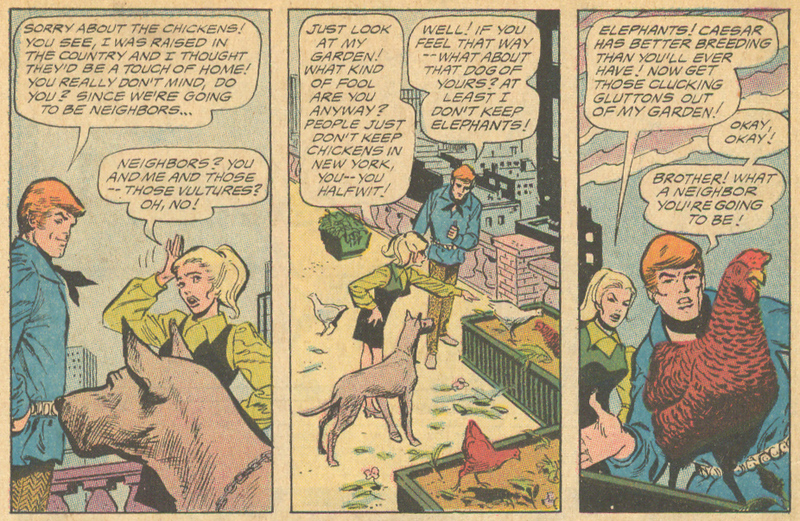 Today's tale of puppy love is "Love Thy Neighbor" from Girls' Love Stories #157 (February 1971). This story, beautifully rendered by Art Saaf, was actually one of the first romance comic book stories I ever read -- and it really stuck with me. Read on to see why! For Millie Hayes and Ben Mason, their first encounter was anything but the proverbial love at first sight. In fact, Millie describes it as just the opposite. Raised in the country, Ben has decided to bring a bit of the farm to the shared penthouse roof. Millie is completely horrified and isn't shy about showing her disdain for Ben's chickens. He in turn lets her know that he isn't that impressed with her enormous Great Dane -- Caesar. Millie attempts to avoid Ben (though she admits there is a physical attraction to him), but random accidents seem to occur whenever the two are in the vicinity of one another. The last straw for Millie is when Ben puts a fence up, dividing the roof in two. She doesn't speak to him for weeks until one day when Caesar tries to jump the fence... and succeeds. Putting aside their differences for a moment, Millie helps the injured Ben by calling the doctor and staying with him while a cast is put on his fractured ankle. The whole ordeal makes Millie realize that she is falling in love with Ben. She asks if they can start over and be friends. Ben erupts with fury, claiming that she is only being nice to him so that he doesn't sue her. Enraged that Ben doubts her sincerity, Millie starts to leave, but Ben stops her. He proclaims his love for her and also admits that he planned all the freakish accidents so that she would notice him. Stunned and a tad confused, Millie kisses him. In a moment of intense passion, Ben proposes and Millie accepts. As they continue to kiss, Millie chuckles with the knowledge that unbeknownst to Ben, Caesar was the catalyst for their reconciliation. Memorable, eh?! The art is wonderful -- as always is the case with Saaf's work, in my opinion. The dialogue is also really amusing. Never were better insults hurled in a comic book romance!!! "Love Thy Neighbor" is a good reminder that hate is often the compatriot of love!